Squeaky Books: Envy. How do you kill it? The other day my blogger-friend Gabrielle Carolina pointed me to a review of Enclave that she thought would tickle my fancy. She was right. That review was by Steph Su (you can read it here) and it was EXACTLY what I had thought about the book, and EXACTLY what I wish I could be articulate enough to say. Instantly I went into a serious bout of blogger-envy/depression. Why can't I write reviews that good? How come I always feel like my reviews are confusing? How come I can't wear pencil skirts? How come people don't want to share my reviews with their friends? I HATE doing that! Even typing all of that down made me want to punch a hole through my computer! I'm glad that I get self-deprecating during envy-bouts rather than cruel. I don't go around saying "She thinks she's so great. Well... she's a poo-face!" or anything like that. Which is good. I don't want people to hate me. But hating myself isn't any better! 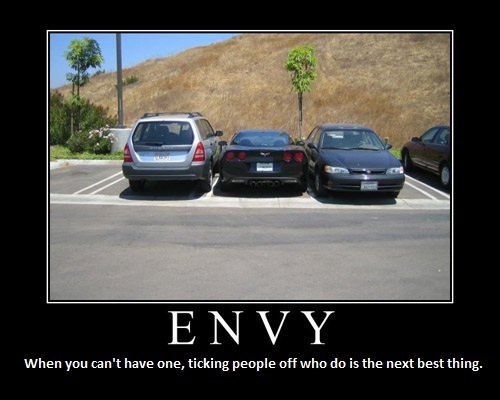 So how do YOU fight envy? It doesn't necessarily have to be blogger-envy. It can be car-envy. Brain-envy. Pencil-skirt-wearing-ability-envy. Anything! I need tips! P.S. Not fishing for compliments here, fishing for advice! You are good because you are different and you are you. You can't really compare because other people aren't you. I honestly don't read many blogs and that helps. And I don't associate with many people. That also helps. Well, a little bit of envy can help you. If you study her posts, ask yourself why you like them, analyze it all, and find applicable principles, you can be motivated to educate yourself by envy. And then you will not be envious any more. Here's the thing though, if it's the crummy kind of envy, you will just give up, right? Because you won't be willing to work to earn the thing you envy. There's my crazy 2 cents. Also I agree with what Heather and Q said. I try to remind myself that comparison is the root of all feelings of inferiority (I think that's a quote from Eleanor Roosevelt, isn't it??) and that I write like me, not like anyone else. Not necessarily better or worse, just different :) But I completely know what you mean. I suffer from writer-envy more than I'd care to admit! I think al bloggers - and all writers - have some form of writing envy at one time or another. It's something that one has to work through. And the thin is, you're a lot better than you think you are in the midst of your self-depreciating spurts. I have writing envy about your blog. I'm always happy to see a post of yours on my blogger dashboard. And I talk about your blog to my friends - a lot. And all good things - seriously. You're awesome. I'm jealous ALL the time. I just accept it and move on and try to make myself better. First things first. Your blog is amazing and you do great things for the blogging community. If you stopped posting tomorrow, believe me, I would notice. I have good days and bad days as a blogger. Some days I get compliments left and right and I can't even breathe without someone complimenting me. Other days, I see how fabulous someone's review or blog is, and I feel depressed and the day goes downhill from there. When those kinds of days happen, I try to remember that I am not alone. Everyone is insecure about something they do. Some of us write better reviews. Some of us are really creative and come up with super-cool memes or have awesome graphics that we are jealous of. Some of us started blogging a long time ago and have honed our skills over years, or we are just really lucky and we get a ton of free books because we were the first on the scene. My point is that it is human to be jealous, but it's what you do with that jealousy that matters. I try to convert it into motivation. And continue to build a better blog. I communicate with those that make me happy and put me in a better mood, and if none of that works, sometimes it is better to shut the computer down and go read by myself. You can't be at your best every day. All of us get envy. I am envious at the way that you come up with awesome, fun contests. As far as reviews go, there are several bloggers that I really admire. When I read their reviews I really try to figure out what it is I like about them. And then I try to do those things in my own reviews. It's how we get better I guess. Um, I read your blog because I LIKE your reviews. I've even shared a few. How many followers do you have? Yeah. Somebody likes your reviews. Get some sleep. That always works for me. Also, you're awesome. I took the bait. ALL THE TIME, I find writers who are better than me. So I'll indulge in a mini-bum out and feel bad for myself for, like, a day. But then I'll go back and reread what made me so upset and try to learn from their style, control of words, pacing, etc. So the more I learn, the better I'll be one day.